How to by genuine Nokia 8800 and how to spot fake Nokia 8800 | iSpotFake. Do you? Nokia 8800 with a lot of editions is a Klondike for fakers. How can we spot if our Nokia 8800 is genuine, not fake? “The Nokia 8800 is based on the Nokia Series 40 operating system. The 8800 features a stainless-steel housing with a scratch-resistant screen and has a weight of 134 grams. The 8800’s “sophisticated slide mechanism uses premium ball bearings crafted by the makers of bearings used in high performance cars”. Also as you may know Nokia 8800 comes in three editions: original 8800, Nokia 8800 Sirocco Edition (8800d) and Nokia 8800 Arte Edition (8800e). “The Nokia 8800 Arte Edition is the significantly updated version of 8800 and comes in four different models. The original arte, the sapphire arte, the carbon arte and the gold arte. The original Arte comes in stainless steel and is only available in black. It features a 2.0 inch scratch resistant OLED screen, 1GB internal memory and a 3.15 MP camera with autofocus. The Sapphire Arte comes in stainless steel, leather and a sapphire stone replacing the navigation button. It features a 2.0 inch scratch resistant OLED screen, 1GB internal memory and a 3.15 MP camera with autofocus. The Carbon Arte comes in stainless steel, carbon fibre and titanium. It features a 2.0 inch scratch resistant OLED screen, 4GB internal memory and a 3.15 MP camera with autofocus. For now we see how many editions Nokia 8800 has, such a variety of models is a Klondike for fakers. How can we spot if our Nokia 8800 is genuine, not fake? 1) First of al check the IMEI number. It is a 15-digit unique number to identify the phone. It is usually found printed inside the battery compartment of the phone. It can also be displayed on the screen of the phone by entering *#06# into the keypad on most phones. After getting this numer go to the page, enter your IMEI number, and you will get exact info about what model phone has this IMEI number. 2) Second thing is the price. Nokia 8800 editions that officially cost over £1000 hardly can cost about $450, right? I can imagine situations that seller “urgently needs money” or just have stolen the phone, but these situations are not we face day-by-day. 3) Third thing is the photos. Always ask for photos when you buy phone online. When seller uses official photos from Nokia site ask him to make a couple of photos, that’s easy, right? Even if photos are ok, but later you get the device which differs from the actual photo you can return the phone. 4) “Chinese version”. There is no any authentic Chinese version of Nokia 8800, there can only be “Made in China” made in China Nokia plants, it is the theme for separate article. Go to any add banner or link claiming “Buy New Nokia 8800 Sirocco Gold Edition per $324!” and you will obviously find very good example of the fake Nokia 8800. On fake Chinese version there may be a lot of things to spot the fake. For example the black keypad you can often find on Chinese Nokia 800 Sirocco GOLD edition, but original one doesn’t. Wrong typings or mistakes, like just “Sirocco” instead of original “Sirocco edition”. Flat back panel of Chinese Sirocco when original has smooth bulging-in for the thumb. There are some codes that you can try on your Nokia 8800 and there should be response. The code *#7780# entered on the keypad by asking you to confirm that you want to revert to factory settings and asking you for a lock code. If your phone doesn’t do this then it’s not a Nokia8800. To get the firmware version of the phone enter *#0000#. If the date of the firmware revision in American format, MM-DD-YYYY, “02-22-2007” for example, then it is the fake. Also there is one very interesting moment happens when you connect your Nokia 8800 to USB of your laptop. If your Nokia phone is genuine it will show you the options “Default mode”, “Printing” and “Data storage” or “PC Suite”, “Mass storage”, “Image transfer” and “Media transfer”. Something like that or combinations. 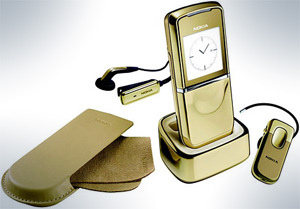 On fakes and never on genuine Nokias you will see options “webcam” and “comport”. We plan to continue make our reviews about fake and genuine Nokia 8800 Editions, watch our new articles. All unclear moments you can ask ask on the Nokia Support Discussions forum. Thanks for linux.sgms-centre.com and Wiki for helping with the material to the article. Previous Previous post: Japador attacks or how to spot fake fragrances and perfumes?